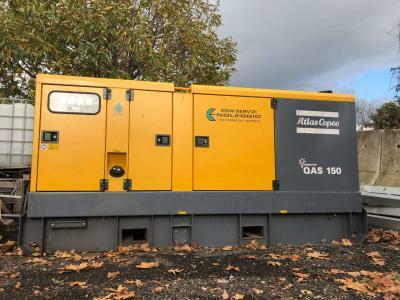 Hours: 81,000 h - GA132VSD Inverter Power 146 kW at 5,5 bar 28,2 M3 / min - Compressor in 2006. Hours: 22,000 h - Power 37 kW â Delivery 95 liters/second - Compressor in 2000. Weight: 3,000 kg - Used and overhauled hydraulic breaker Atlas Copco HB 3000 YOM 2001 with n. 1 tool Specs: Operative weight (kg): 3.000 Frquency (c/m): 280 – 540 Oil flow (l/m): 210 – 270 Operative pressure (bar): 160...continue. Ask for price - Weight: 2,510 kg - For excavators from 32 to 50 ton Unused - Hydraulic hammer in 2001. Ask for price - Weight: 1,500 kg - Operating Weight 1.500 Kg Recommended carrier category 17-29 ton Oil Capacity 120-155 lt/min Operating Pressure 160-180 Bar - Hydraulic hammer in 2011. Ask for price - Weight: 700 kg - Operating Weight 700 Kg Recommended carrier category 10-15 ton Oil Capacity 80-120 lt/min Operating Pressure 140-170 Bar - Hydraulic hammer in 2008. Ask for price - Weight: 9,500 kg - General good condition used equipment, ready for use. - Hydraulic hammer in 2005. Ask for price - Width: 500 mm - Weight: 130 kg - New equipment, ready for use. - Vibratory plate compactor in 2017. Ask for price - Width: 500 mm - Weight: 89 kg - General good condition used equipment, ready for use. - Vibratory plate compactor in 2013. Weight: 750 kg - for excavators 10-17 tons oil flow 80-120 liters / minute working pressure 140-170 Bar - - Hydraulic hammer in 2011. Weight: 550 kg - General very good condition used equipment, ready for use. - Hydraulic hammer in 2006. Hours: 2,700 h - Used equipment ready for use. - Power generator in 2003. Hours: 5,972 h - Excellent condition used equipment, ready for use. - Power generator in 2007. Ask for price - Weight: 11 t - Hours: 1,090 h - Engine: Deutz diesel aspirated - 4 cylinders Rod type: R32 Equipped with: - Rods Charger - Dust Collector - Vertical directional drill in 1991. Ask for price - Weight: 200 kg - General very good condition used equipment, ready for use. - Hydraulic hammer in 2013. Weight: 252 kg - Adapter plate Tool and paint genuine - Hydraulic hammer in 2009. Weight: 97 kg - Hydraulic hammer Atlas Copco SBC 255-II, year 2003, weight 97 kg, hydraulic system max delivery 40 lt/min, hydraulic system pressure 150 bar, previously installed on backhoe loader JCB 1CX. - Hydrauli...continue. Hours: 973 h - 7 bar â 3.0 m3 / minute - Compressor in 1990. Hours: 4,203 h - Working pressure 12 bar Air delivery 19 m3 / min - Compressor in 2005. Used equipment ready for use. - Compressor in 2004. Used equipment ready for use. - Compressor in 1992. Ask for price - Hours: 1,950 h - Pressure 7 Bar Capacity 3.900 lt./min Engine Deutz 3 cylinders - Compressor in 1999.